Hennessey Venom GT Spyder from U.S. International Sports Car maker Venom GT, is now the world’s fastest open-top sports cars. Recently the car accelerated the speed of 427.4 km/h by running over 2.9 mile long runway crossing through US Navy base Lemoore in California. The car was driven by Brian Smith, Director, Ford Performance Racing School. The drive was organized to commemorate the 25th Anniversary of Hennessey Performance, as reported by Mr. John Hennessey, Founder saying “I thought that this would be a special way to celebrate 25 years of making fast cars faster. 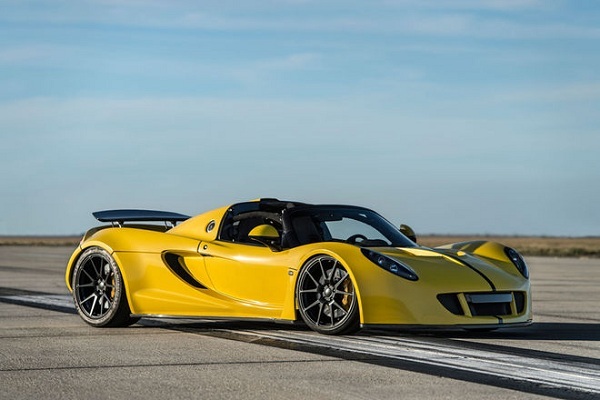 I’ve wanted to test the top speed of our Venom GT Spyder, without the roof, ever since our coupe ran 270.4 mph on the Space Shuttle landing runway at NASA’s Kennedy Space Center in 2014. This was a great way to validate the technical excellence of our car which includes high-speed stability with an open roof.” By reaching this top speed Venom GT Spyder beat Bugatti Veyron Super Sport Vitesse. Empowered with twin-turbo 7.0 LV8 engine generating the power of 1082 kw at 7200 rpm and torque of 1744 Nm at 4200 rpm at mated with six speed manual gear developed by Ricardo. The car reaches the top notch from standstill to 96 km/h in the span of 2.4 seconds. It is reported that encouraged from the landmark achieved by GT Spyder, Mr. Henessey speculates to organize three drives of the GT Spyder’s Unit and pay homage to successful existence of 25 years.